This week’s geopic is a bit of a stretch, but since ice is technically a mineral, a frost flower is a crystal form of the mineral ice. Plus they are just cool. 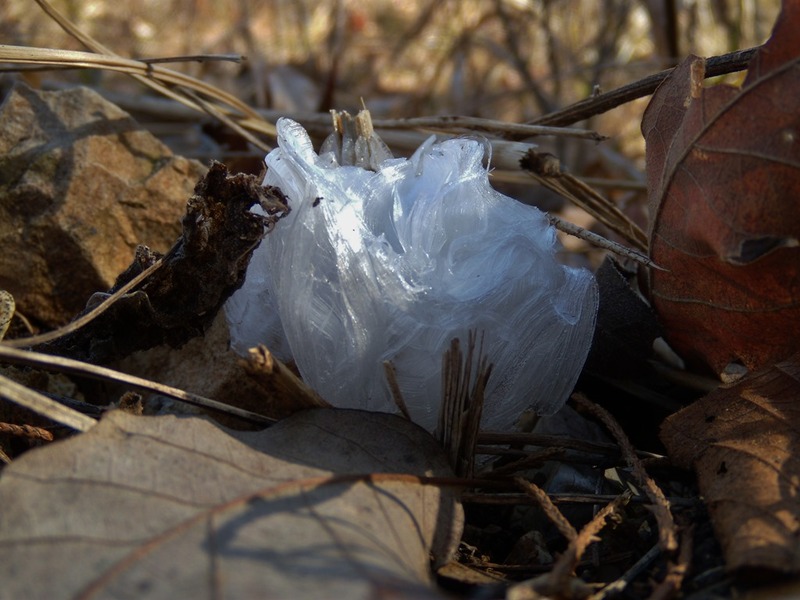 Frost flowers form when the air is below freezing but the ground isn’t frozen. In Arkansas, these conditions typically occur early in the morning in Fall or Spring. They begin due to freezing of moisture in the stem of a plant which expands and makes small cracks in the stem. Water in the plant freezes as it is extruded from the cracks, and more moisture is continually wicked up from the soil. The resultant ice forms delicate ribbons that curl around the stem resembling flower petals. Because they are so fragile and rarely last more than a few hours, most frost flowers are never seen. If you happen to be out on a crisp morning, come across one, and you have a camera handy, be sure to take some pictures. 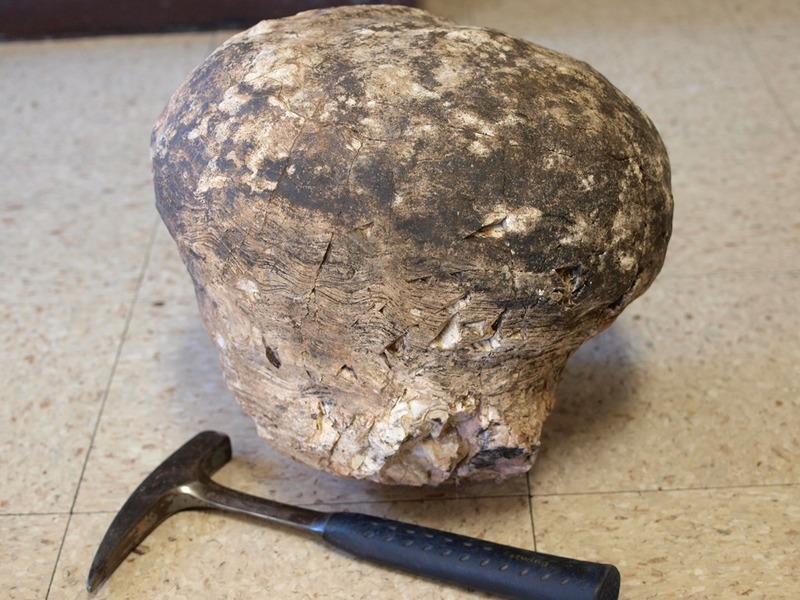 This entry was posted in #geoblog, GeoPic of the Week and tagged Arkansas, frost flower, holocene, Ozark Mountains on August 28, 2015 by argeology. This entry was posted in #geoblog, GeoPic of the Week, More Views and tagged Arkansas, Crystals, Little Rock, Ouachita Mountains, Quartz on August 19, 2015 by argeology. Above is a picture of the State Mineral of Arkansas, quartz. Quartz crystals are found in the Ouachita Mountains from Little Rock to Oklahoma. The crystals grew in fractures and vugs in the sandstone and shale as hot, mineral-rich water from the compression of the Ouachita Mountains circulated through the bedrock around 260 million years ago. Like all crystals, quartz grows in a distinct shape. 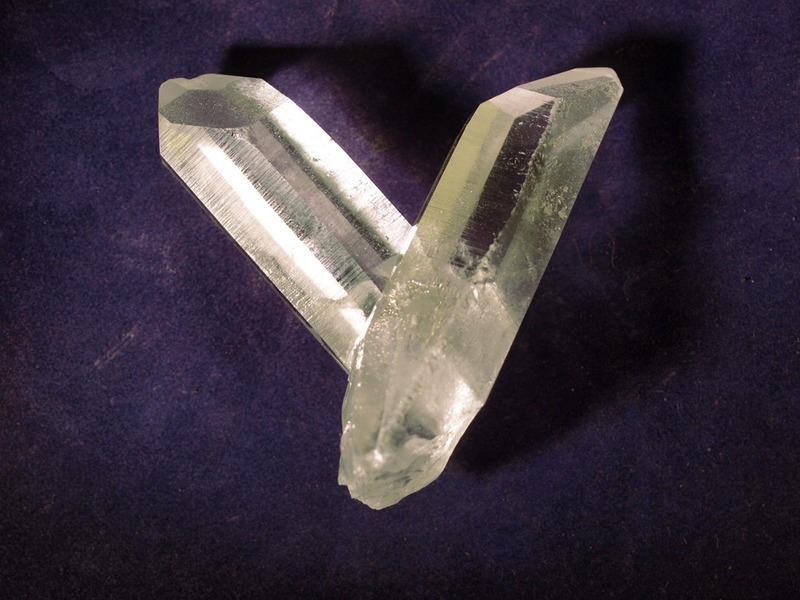 The six-sided shape of quartz is due to the arrangement of the molecules (SiO2) that comprise it, which pack together in this shape naturally. Quartz crystals are prized for their beauty, but are also useful in devices, such as radios and clocks, because of their electrical properties. Mineral collectors flock to Arkansas for a chance to find world-class quartz crystals. There are 7 locations around the Ouachitas where you can prospect for quartz crystals for a fee. This entry was posted in #geoblog, GeoPic of the Week and tagged Arkansas, Crystal, minerals, Ouachita Mountains, Quartz on August 19, 2015 by argeology. Pictured here are the fossil remains of the first living organisms known to ever flourish on earth: the stromatolites. They were not giant, ugly mushrooms, as you might expect from this picture. They were in fact, structures built by microbes, and made of sediment they trapped in their secretions. Stromatolites are formed by colonies of marine bacteria or algae. They build the stromatolites up into mounds, like the one above, by secreting a layer at a time. The algae and bacteria are shallow water critters that absorb their energy from the sun and don’t require oxygen, thus they were able to thrive in the oxygen free atmosphere of early earth. Though they lived more than 2.7 billion years ago, they still exist today, but they aren’t abundant anymore. This stromatolite fossil was collected in northern Arkansas from the Ordovician Everton Formation, and is about 450 million years old. This entry was posted in #geoblog, GeoPic of the Week and tagged Arkansas, everton formation, fossils, Ordovician, stromatolites on August 11, 2015 by argeology. This entry was posted in #geoblog, More Views and tagged Arkansas, everton formation, fossils, Ordovician, stromatolites on August 11, 2015 by argeology. This entry was posted in More Views and tagged archimedes screw, Arkansas, Bryozoan, Fossil, Mississippian, Pitkin Formation on August 3, 2015 by argeology.